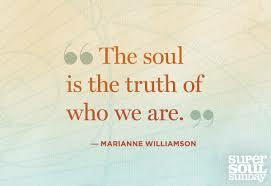 Our Soul is the truth of who we are. We are not the thoughts that stir in our minds. We are not the conditioning of our Ego’s. Our Soul is the authenticity of why we came to Earth to live this life. It is our Soul that calls to us, gently whispering to our Inner Self. Our Spirit gives us our sense of identity, our emotional and intellectual energy, our Soul is the life force that resonates deep inside of us. Every Mortal Being born to this Earth has a Soul. Every man, woman and creature, has within them an embodiment and essence of a specific quality. There will be some of us that seek and search to finds ways to connect to our Souls, and then there will be others that have no interest. These people live only by the direction of their Ego’s. Givers and Takers roam this planet. The Givers find ways to be ‘Selfless’, the Takers scour to be ‘Selfish’. Those of us who hold compassion and empathy for the World will eventually find true happiness. The Ego rebels against anything that is not self-important, the Takers will never be at peace. Their Ego’s are constantly looking for food. Feeding their self-esteem, and self-image is a forever task. Hungry for manipulation and disrespect, there minds never stop talking. Like a broken record that plays over and over again, so does the voice inside of their head, repeating ‘I’m hungry, find food’. Be careful all of you Givers, the Takers are everywhere. Use the tool that the Universe provided you to protect yourself – your ‘Intuitive’. Intuition is energy, trust when you feel the energy that surrounds you is negative. And beware.